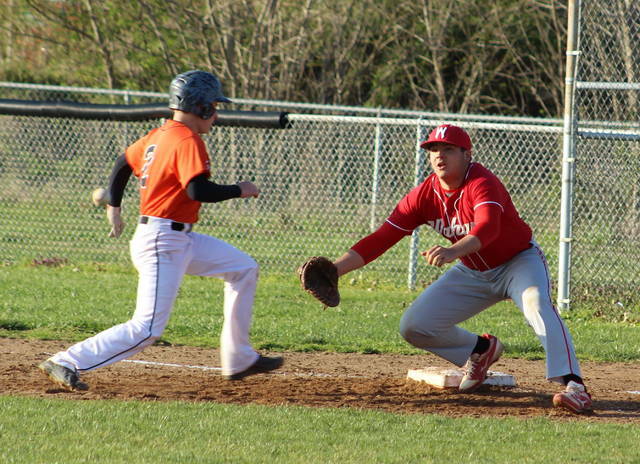 Wahama second baseman Jonathan Frye, right, applies a successful tag to a Belpre baserunner during the fifth inning of Tuesday night’s TVC Hocking baseball contest in Mason, W.Va.
MASON, W.Va. — A different day. A different outcome. 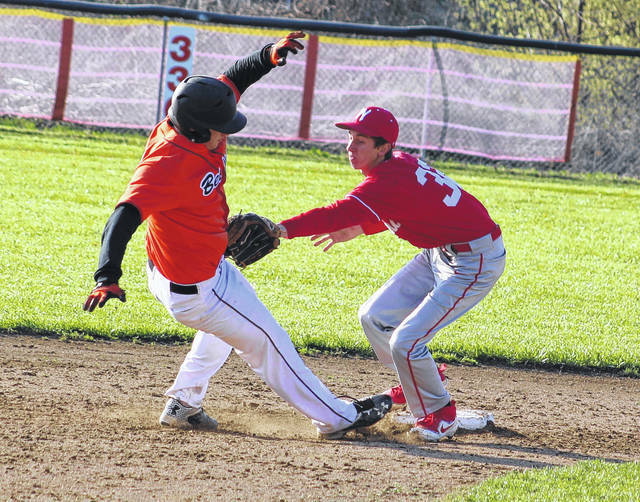 After handing Belpre an 18-9 loss this past Saturday, the Wahama baseball team struggled to find any offense during the rematch Tuesday as the visiting Golden Eagles picked up a stellar 6-1 decision in a Tri-Valley Conference Hocking Division contest at Claflin Stadium in Mason County. The White Falcons (7-3, 5-2 TVC Hocking) never led in the contest as the hosts fell behind 2-0 midway through the fourth inning before showing any signs of offensive life. The Red and White started the bottom of the fifth with a lead-off double from Trevor Hunt, who was then replaced by pinch-runner Ethan VanMatre. VanMatre advanced to third on a wild pitch, then came around to score two pitches later as Dalton Kearns reached safely on an error — trimming the deficit down to 2-1 after five complete. The Orange and Black, however, caught a big break in the sixth as a two-out error led to two big insurance runs while extending the lead out to 4-1. Jacob Davis started the rally with a two-out single, then advanced to second on a wild pitch. Bailey Sprague hit a ground ball to an infielder, but the throw went wide of first base — allowing Sprague to reach safely as Davis scored for a 3-1 contest. Sprague later stole second and eventually scored on a single by Isaac Tullius that increased the lead to three midway through the sixth. 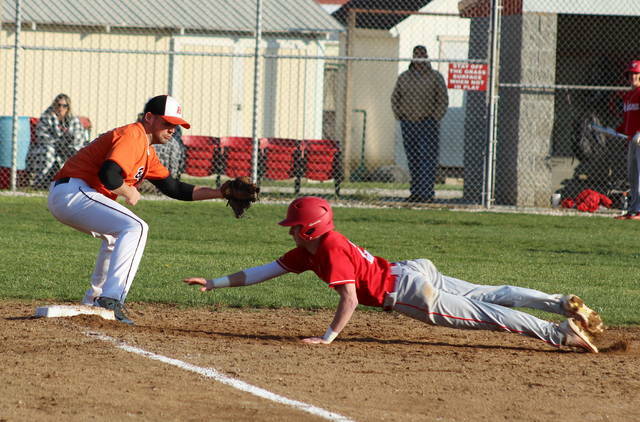 Wahama didn’t manage another baserunner the rest of the way, and BHS added a pair of scores in the top of the seventh as Davis and Logan Adams both provided RBI singles that wrapped up the five-run triumph. Adams scored the first run of the night on a Tullius fielder’s choice in the first, then Kole Knotts scored on a one-out error in the fourth for a 2-0 edge. The Golden Eagles outhit the hosts by an 8-5 overall margin, and Wahama committed three of the five errors in the contest. Another key in the final outcome were the extra chances provided to Belpre, who benefited from five walks and three hit batters. The White Falcons drew just one walk in the setback. After the game, WHS coach Billy Zuspan wasn’t as much disappointed as he was impressed with how well Belpre played on this given night. He thought that his troops did a lot of positive things, but these Golden Eagles were just a different animal. “That was just a good old-fashioned baseball loss. They played a pretty clean defensive game and made all the plays they needed to make against a pitcher that did a pretty good job out there tonight,” Zuspan said. “I felt like we hit the ball well, but it seemed like it ended up going right where one of the defenders were. We just never could get anything going offensively and one run doesn’t win too many ball games. Wahama left runners stranded at first and second with two outs in the second, then Kearns was left at third base with two away in the third. The hosts also had runners at first and second with one out in the fourth before the inning ended with a double play. Overall, the White Falcons left four runners on base and the guests stranded a dozen on the bags. Half of Belpre’s runs were also unearned. Nick Godfrey was the winning pitcher of record as the southpaw allowed zero earned runs, five hits and a walk over seven innings while striking out three. Kearns took the tough-luck loss after surrendering two runs (one earned), three hits and three walks over four frames while fanning five. Kearns, Hunt, Tyler Bumgarner, Antonio Serevicz and Cooper Peters had the lone hits for the White Falcons. Davis paced BHS with four hits, followed by Adams, Tullius, Godfrey and Jesse Collins with a safety apiece. Wahama returns to action on Thursday when it travels to Trimble for a TVC Hocking contest at 5 p.m.